Every Gold train into the heart of the city comes through Grand Central Terminal. There are no less than 5 subterranean levels of railroads stacked in the basement of this century-old grande dame. And more than enough space for a concert in the lobby. WTF is this used for?? CERN, located in Geneva Switzerland. Called The Large Hadron Collider. Uses as much energy as it takes to run a 300,000 population city. Originally built in 1954. Symbol is 666. W.T.F.? 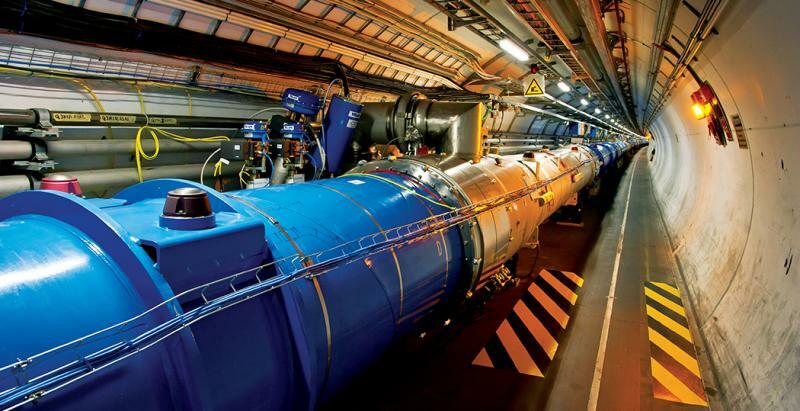 The Large Hadron Collider (LHC) is the world’s largest and most powerfulparticle accelerator. It first started up on 10 September 2008, and remains the latest addition to CERN’s accelerator complex. The LHC consists of a 27-kilometre ring of superconducting magnets with a number of accelerating structures to boost the energy of the particles along the way. Thousands of magnets of different varieties and sizes are used to direct the beams around the accelerator. These include 1232 dipole magnets 15 metres in length which bend the beams, and 392 quadrupole magnets, each 5–7 metres long, which focus the beams. Just prior to collision, another type of magnet is used to “squeeze” the particles closer together to increase the chances of collisions. The particles are so tiny that the task of making them collide is akin to firing two needles 10 kilometres apart with such precision that they meet halfway. All the controls for the accelerator, its services and technical infrastructure are housed under one roof at the CERN Control Centre. From here, the beams inside the LHC are made to collide at four locations around the accelerator ring, corresponding to the positions of four particle detectors – ATLAS, CMS,ALICE and LHCb. He has executive powers that he has given himself, allowing him to kill anybody at any time, just because somebody “thinks” that there “might” be a reason to do so. Yet he is not the most powerful man in the world. What an indictment of the fool on the hill!!!!! I guess the Beatles had vision. It keeps going through my head, so I had to put it down in writing. conn seems to be heating up folks! After a brief hiatus the previous week, speculators have piled back into the most-over-crowded trade in the world – Long The US Dollar. As Goldman Sachs notes, overall USD speculative net long positioning increased $2.0bn to $45.7bn – a new record high. Is the Smart Money Prepping for an S&P 500 Collapse to 450? The Fed and other Central Banks have done everything they can to convince investors to buy stocks. They’ve cut interest rates over 500 times, with some region’s now actually charging depositors for the right to park their cash. They’ve bought over $10 trillion worth of bonds in varying forms of QE, perverting the price of “risk” across the board with the hope investors would move into risk assets. It worked for a time. Those who had a lot of money to begin with (the top 0.1%) rode the rally that has seen stocks more than triple from their 2009 lows. It’s not working anymore. The wealthy and superwealthy are now actively dumping stocks and moving into just about anything else. Gold bars ($300K+ per unit kind) are selling at a record pace, having risen over 200% from the year before. The contemporary art market broke above annual sales of $2 billion for the first time in history, rising over 40% from last year. Luxury real estate sales are hitting new records globally with some projects selling for over $5,000 per sq. foot in London and other cities. Billionaires are sitting on record amounts of cash. They’d rather earn nothing or even be charged than own stocks. What does this tell us about the stock market today? If the people who have benefitted the most from this raging bull market are moving OUT of stocks and into literally ANYTHING ELSE including cash, which is currently yielding next to nothing? Bear in mind, institutional investors have also been net sellers of stocks for all of 2014. And the individuals who know about their companies than anyone (corporate insiders) are unloading shares at a pace not seen since the height of the Tech Bubble? These people know the gravy train is about to run off the rails and they’re looking for safety. They don’t care if they miss out on another 5% gain in the stock market, they want to get out of stocks NOW. (AP:COPENHAGEN, Denmark) COPENHAGEN, Denmark (AP) — Danish company OW Bunker, the world’s largest ship fuel supplier, has declared bankruptcy and reported two employees at its Singapore subsidiary to the police following fraud allegations. The company, based in Aalborg, northern Denmark, said Wednesday it had lost around $275 million through a combination of poor risk management and fraud committed by senior executives at its unit Dynamic Oil Trading in Singapore. It didn’t immediately provide more details about the fraud allegations. I have to agree my friend. When the notes come due, they create the $s out of thin air. eg. add to the fiat supply. Inflate one way or another. They may do it the same way they do today and create fresh new notes or bonds, or they may just create the $s as a computer entry and to hell with the old ways. At some point it won’t matter, it will just be some mechanism to create the $s, because they will never pay off the trillions in debt and hundreds of trillions of unfunded liabilities with taxes, or sales of grubbermint “assets”. Mr.Copper @ 23:14 Goldbugs JUMPING out of windows ? they used to say when Bankers are jumping out of windows think about following them…..there must be money to be made down there ! All this pricing nonsence will stop when ISIS Attacks Saudi Arabia..now that the US no longer needs them…..then watch oil & Gold take off ! when that idiot Clinton and Reubin refinanced all US debt from Long term to short term in order to look like a HERO reducing the then Current Rate Payments enough to look like a Hero in Balancing the Budget …Clintons BUDGET Balancing act was a FRAUD ! The current FED now has to deal with it…All current debt is short term……there is NO inflating it AWAY …Debt to be paid in the FUTURE is paid with inflated dollars …not TODAYS DEBT…! All those F–king idiots that thought Clinton and Reubin were so smart now have to deal with their Fraud….You cant inflate your debt away until you can finance 10,20,30 year Bonds into the future !